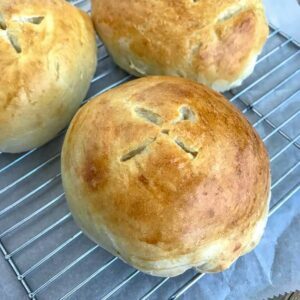 These Homemade Italian Bread Bowls are easy to make and perfect for chili, soup, dips and more! Learn how to quickly and easily make bread bowls at home in around an hour. 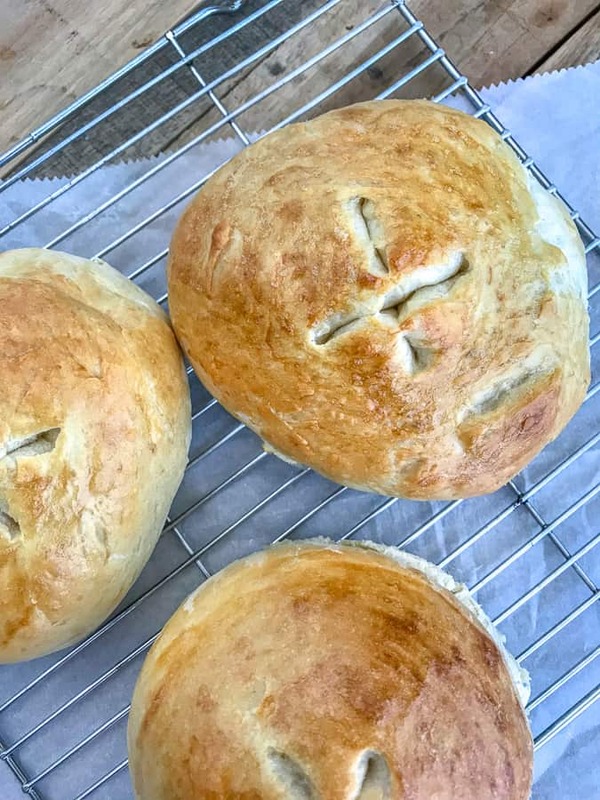 These bread bowls only use 6 ingredients! They are golden and crispy on the outside, while being soft and fluffy on the inside. I don’t know about you, but my husband and I are living off of soups to help get us through these cold winter months! We have been on a Winter Weather Advisory for days and I have zero plans on going outside unless I have to. 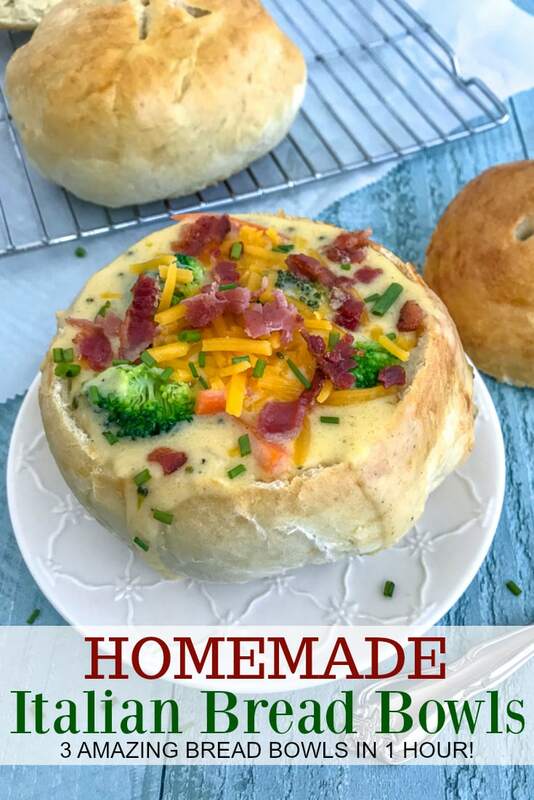 Give me a warm cup of coffee and allow me to curl up with this warm, fluffy Homemade Italian Bread Bowl stuffed with soup! I will be happy. One of my favorite things to get while out and about is a bread bowl with Broccoli Cheese soup at Panera. One thing I do not like? The high calories, fat, sodium and such that goes along with it! Which is why I am a stickler for making whatever I can at home, so long as I can. But I also live a little, so don’t worry! 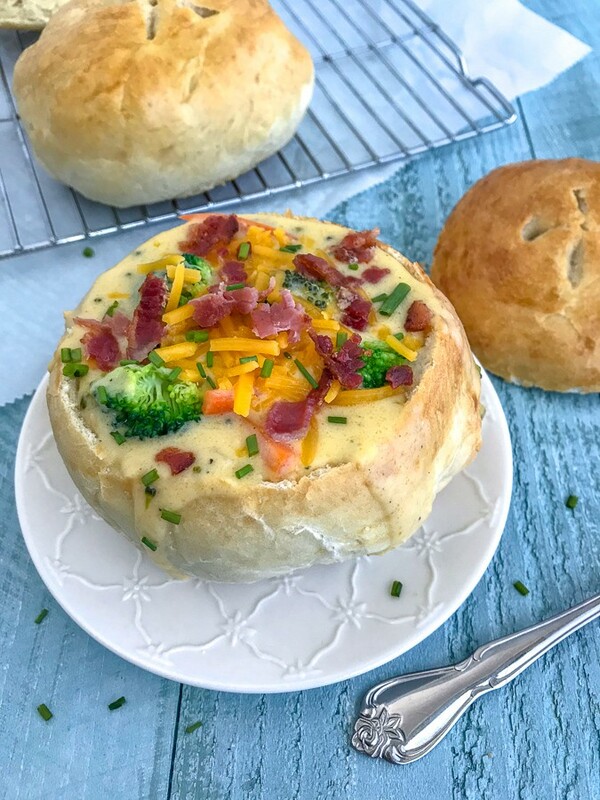 This Homemade Italian Bread Bowl filled with my Easy One Pot Broccoli Cheddar Soup is the bee’s knees! There’s nothing I love more than this combination. 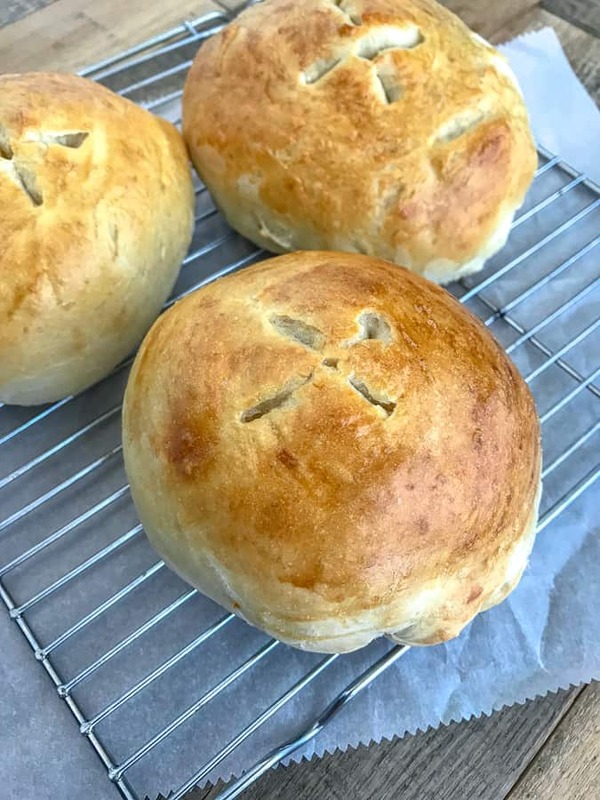 Homemade bread bowls are a lot easier to make than you think! You are not limited to making bread bowls out of this recipe! Make these into smaller dinner rolls or even use it for pizza dough. YUM! I have made both out of this dough and they are phenomenal. Don’t be scared to add some seasonings to the dough such as garlic powder, rosemary, or some Italian seasonings. Butter the tops and add a parmesan garlic coating. The delicious options are endless! Golden and crispy on the outside while soft and fluffy on the inside. Perfect bowls for soups, stews, chilis or even your favorite dip! To a 2 cup glass Pyrex measuring cup, add the warm water and measure temperature using a thermometer to ensure that it is 115 degrees F. Add in the yeast and sugar. Stir to dissolve. Allow to sit 5-10 minutes. While you're waiting, combine the flour and salt into the bowl of a stand mixer (or large mixing bowl if by hand). Add the dough hook attachment and start the mixer on slow speed. Gradually pour in the yeast mixture and then increase the speed to medium. Add in the olive oil, drizzling over the flour as the mixer is going. Mix until a solid ball of dough forms. You may need to stop the mixer and scrap along the edge of the bowl to release some of the flour mixture. Transfer the ball of dough to a separate large greased bowl. Cover with a clean towel and leave it to rise for 20 minutes. The dough should almost double in size. Remove the dough from the bowl and slice it into 3 equally sized portions. I measured each on a scale at around 8 ounces each. Roll each one between your hands to form a smooth, round ball. Place onto the prepared baking sheet. Cover again with the towel and leave it near the stove for 10 minutes to rise a smidgen more. Preheat the oven to 400 degrees F and place the top rack into the middle of the oven. Line a large baking sheet with parchment paper. Add the egg white to a small bowl. Brush each ball with the egg white. Using a pair of kitchen scissors or knife, cut an X into the center of each ball. Bake for 15 minutes, remove and brush with a little more egg white and allow to bake for 8-10 more minutes. Or until they are golden brown on the outside with a hollow sound on the inside when you tap it. Allow to cool 5-10 minutes before handling. Using a sharp knife, cut a large, wide circle around the top of each roll, cutting a little ways towards the center to ensure easier removal. 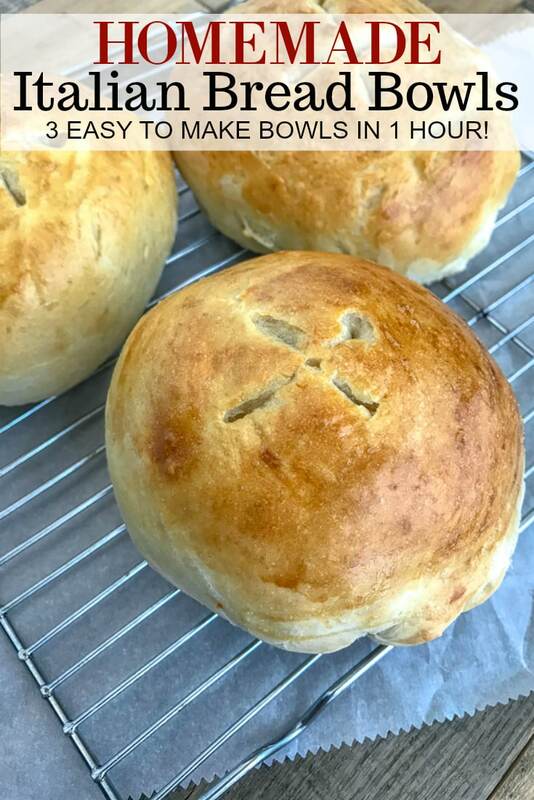 Scoop out any extra bread from the center, as desired, and fill with your favorite soup! Or try my Easy One Pot Broccoli Cheddar Soup.